My last entry was about blessings, and how God has orchestrated things in my life over the past few months. I prayed a lot about these things and it is funny that I should be surprised when God answered them. This last week I was doing an exercise where I had to write out my testimony. One of the things I wrote about was my early understandings that there was a God who answered prayers. I believed in God from a young age, and enjoyed hearing all the bible stories. My family prayed a decent amount when I was small, and encouraged me to pray as well. It made me feel good, and from time to time things happened that were answers to prayers. The first time I can remember feeling like I was “smacked on the side of the head” after realizing God did something for me because I asked was at the age of 7. 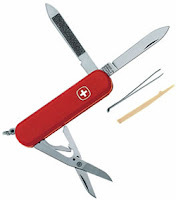 It is tradition in the Chapman house that all boys get a small Swiss army knife when they turn 7. Or at least my dad got one then, and chose to give me one on my 7th birthday too. I won’t go into detail about whittling sticks, cutting my fingers, or when/if I have a son I intend to do the same when he turns seven. The point is I was told I was finally big enough to own something as dangerous as a knife. Just like my dad had been given one when he was big enough, I too was big enough now. I loved this little red knife, and liked thinking of my dad when he was small like me. How did he go from being like me to being so big and cool. Now that I had this little knife, I was on my way to being just like him. Anyway, one day the inevitable happened and I lost it. I had lost it before, but would find it fairly quickly. This time though, I had looked high and low and it was nowhere. To make things worse, I was being picked up in a few minutes by a missionary pilot to go spend a week with my grandparents at a different village. I was in a panic because I wanted to show my Grandparents, my dad’s parents, my little knife. I had looked everywhere, and there was nothing left to do but pray. I knelt down and prayed a quick prayer, nothing special, just “God please help me find my knife” and BOOM, the first thing I saw when I looked up from my little bow was my knife. It was sitting right on my dresser. I had looked there many times that morning and somehow missed it. It was in that instant that I realized that prayer worked. Now I know this is a silly story, and not being able to show my grandparents a little knife is not that big a deal. But that was what was important to me at that time, and the way God chose to teach me a lesson. I have thought about this incident many times. Since then I have prayed and seen results in other things. Sometimes not immediately, or the results I wanted, but in the end things work out. So how do I know it is God and not just some random happening? When I was 7, I did everything in my power to find that little knife, and I finally realized that nothing I could do would find it except pray. I believed God could help me find it. Simply put, believe God can do it and he will. Now we can’t just ask for whatever we want and God will give it, but we need to be in tune with God and patient sometimes to get what is best for us. Some times God wants some thing else, that we don't understand. I believe in God and that he answers prayer. I have seen seeing things happen in my life and others that don’t make sense other than there was something out of this world that interceded. Personally I find it kind of hard to believe that all of the things I have seen are pure chance. So in the end it all comes down to faith. Believing in God and understanding that he has the power to and will help us when we ask. I have been doing a lot of praying recently and am anxious for answers, but also to see how God is going to answer them. Now I just have to wait for his answers. Is there any thing you are at a loss over that you should pray about? How did I end up in Portland?